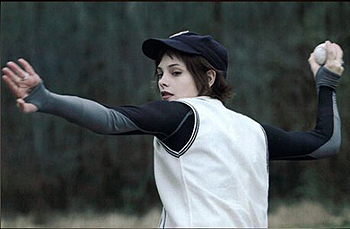 I’m going to make a full post in the future about Alice’s baseball uniform, but for those of you who are looking to put together a movie-accurate version, there’s an opportunity for you on Ebay right now. Beneath her vest, Alice wears a black and gray under armour compression shirt by Cold Gear. It’s identifiable through the thumb holes and gray bands that run along the arms and sides. Like… well, everything Alice wears, this under armour isn’t sold in stores anymore, so it’s really hard to find. Luckily, there’s one on Ebay right now in a size small, with a starting price of only $4.99 USD. I wouldn’t be surprised if the bidding gets up there in price, just because it’s a rare item and pretty essential to an accurate baseball costume, but I’d thought I’d give you guys a heads up. 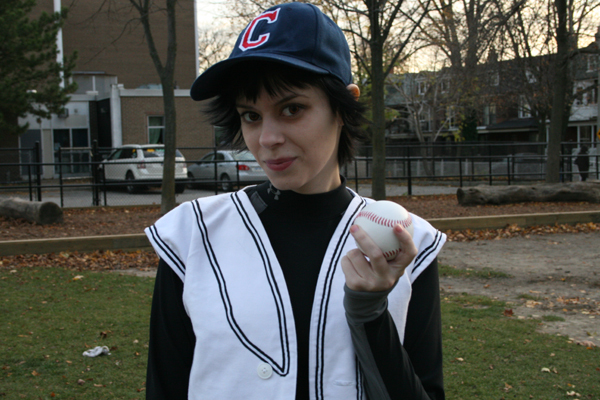 This shirt makes the baseball uniform my favourite costume to wear in the cold weather, because it’s great at keeping your body heat in. Just as a warning, though, it’s a really close fit! I thought I would need an extra small, but a small was just fine. And if small isn’t your size and you need this shirt, keep looking on Ebay with the search term “cold gear under armour” — they pop up every so often. Can you give me the style # of the under armour top?! thank you!! !